Apparently a Cintiq is a fairly straightforward device. It’s basically a Wacom tablet (which operates on a principle of magnetic resonance) with an LCD in-between. 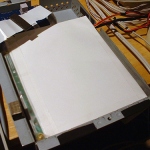 The digitizer consists of a large plate with circuitry that somehow creates an electrical field. It’s the interaction with the pen that not only powers the pen, but follows it. 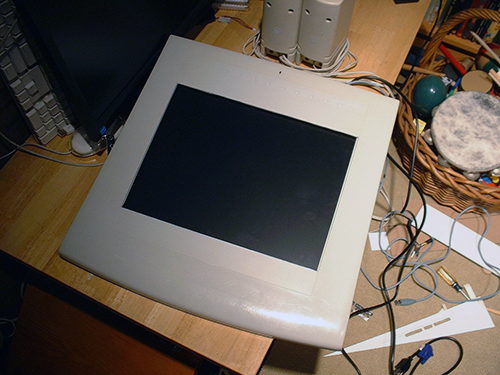 Thus, making your own Cintiq – the Wacom tablet monitor that can be drawn on – is a matter of slipping the LCD in-between the digitizer and the front cover of the tablet. Keep in mind that a proper Cintiq is an expensive piece of gear. What if you buy one for two thousand dollars but you don’t end up liking it or using it a lot? I am standing on the shoulders of giants, here. 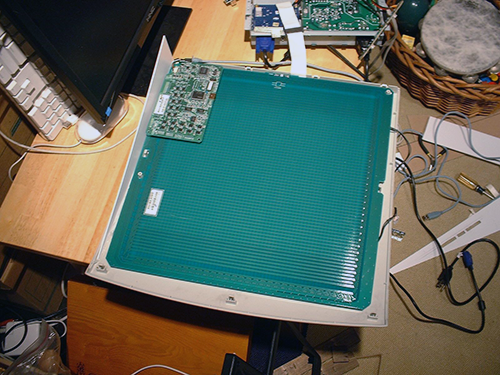 There are numerous DIY Cintiq builds out there, many of them fairly sophisticated. The main requirement of mine was that it be cheap. Thus, the first element to be secured was an old LCD I had lying around. I used one that was about 18″ on the diagonal, giving me a width of almost a foot. I knew that very old Wacom tablets could be had on eBay for fairly cheap, and a popular model was 1ft. by 1ft. There was one that was 18″ long, and that would have been much better and would have allowed for larger monitor, but this was not so easy to come by. I have not illustrated this build as well as I could have. 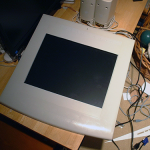 But here is the Wacom tablet with the cover off, showing the digitizing plate. What is not so clear here is that I have already cut a hole in the front of the tablet corresponding to the size of the LCD, which I have already torn down. I found an Intuos tablet (GD 1212R) for only $50. They can be had for less from time to time, but you have to make sure they come with a pen, or they are useless. The pens are not interchangeable. 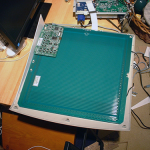 The LCD will go under the green plate that is shown here. The trouble is that an LCD has a power inverter and usually a kind of faraday cage. It’s essential to place all these elements so that the magnetic fields do not compromise each other. The good thing is that all these components are already here and already working, so it’s just a matter of fitting them together. The Wacom case was already a sturdy, stable surface, but with the addition of the LCD and the faraday cage, there was no way it was going to close again. The next photo shows the LCD in place. You can see a couple pieces of non-conductive wood at the bottom to keep the LCD in place. You can also see a triangular section of plastic I cut to fit along the side of the tablet case. This will give me the new space I need to fit the LCD under there. Luckily this also gives the tablet a kind of new tilt that makes drawing quite comfortable. 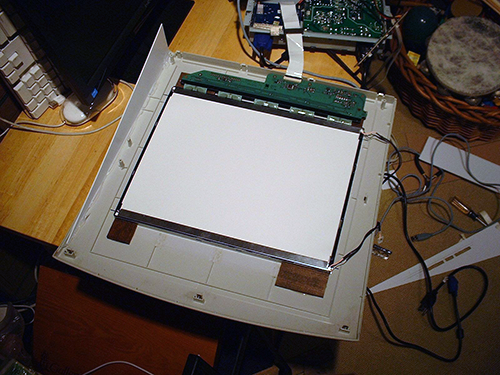 An LCD has a pair of extremely thin fluorescent tubes at the top and bottom, as you can see here. Those are connected to the power inverter and some sort of other controller board into which the monitor signal goes. So it’s as if the digitizer is in the middle of an LCD sandwich, with all the delicate ribbon connectors wrapped around the edge of the digitizer. This was obviously an issue later on, because those ribbon connectors are pretty delicate. During the build one of them suffered some kind of short or break, resulting in a few lines at the edge of the screen. If you attempt this sort of thing, be careful. There’s no cure for a broken ribbon connector. You just have to find another one or wire up something on your own. 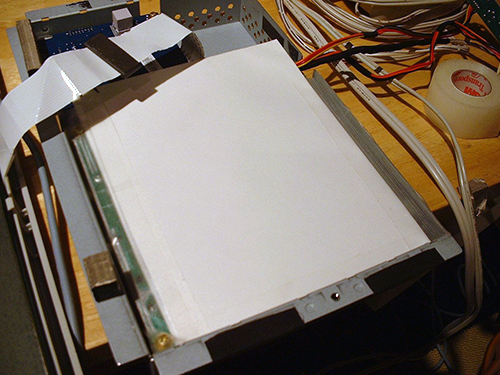 You can also see in this photo that I taped a piece of folded-over paper between the faraday cage and the digitizer, just to act as an insulator. It’s actually a piece of aluminum foil in-between two pieces of paper to provide a kind of shielding. The fields are not terribly strong from the LCD, so this worked out perfectly well. There are a number of projects to maintain old Wacoms, including builds to convert the old RS 232 connectors to current USBs and the Tablet Magic project which keeps old Mac serial connector Art-Z Tablets running!